The unwanted formation of scale and detrimental impact of metallic corrosion can be significant issues that affect the operation and maintenance of closed circuit water systems. Closed circuit heating and cooling systems must be well maintained to operate at optimum efficiency so it is essential that the correct water conditions are maintained at all times. This can be achieved using carefully selected inhibitors designed to control corrosion, scale/fouling and maintain flow and heat transfer. Our advanced closed circuit inhibitors have been scientifically formulated to protect closed systems including closed chilled water, low, medium and high temperature/pressure heating systems from the effects of both metallic corrosion and fouling all within in a single product. 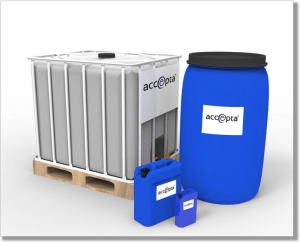 Accepta’s scale & corrosion inhibitors deliver improved performance, helping to reduce maintenance costs, improve reliability and optimise operational efficiency. To help you find the inhibitor type you require we have tabled them multiple times to show the suitability for system material and system temperature. Accepta 2309 Multi-metal systems including those containing aluminium Particularly popular, easy to use synergised molybdate inhibitor for LTHW, MTHW and chilled water systems. Gives protection to all metal types including aluminium. Accepta 2320 Heating & chilled water systems Tannin, low alkali, polymer based product for corrosion protection in predominantly steel systems. Also suitable for low pressure steam boilers. Accepta 2889 Heating & chilled water systems Tannin, alkali, polymer based product for corrosion protection in predominantly steel systems. Also suitable for low pressure steam boilers. Accepta 2332 LTHW & chilled water systems Combined nitrite and molybdate based inhibitor for steel, copper and brass systems. Low dosage rate. Accepta 2346 pH Conditioner Special supplementary additive for systems containing aluminium where it is necessary to adjust the pH into the target range of pH 7.0 – 8.0 for protection. The chemicals have been sorted here by suitability for system temperature. The chemical have been sorted by suitability for system materials. Note on Aluminium: Closed systems containing aluminium are considered high risk due to the potential for galvanic corrosion, the decision on chemical treatment should be carefully considered as it may require specific inhibitors and a higher than typical dosage to maintain adequate protection. Accepta recommends Accepta 2309, a Synergised Molybdate treatment for these systems, a link to this product page is listed in the table above. Note on Hard Water: The permanent or temporary installation of a water softener may be required where the available water is quite hard and especially where there are lots of leaks as these can leave abrasive evaporation deposits & form scale. Please note, the make-up water should not be entirely softened as the total removal of calcium can make the water more corrosive. However, be aware an underused water softener may become a source of bacterial contamination and may not be ideally suited for applications where it’s sole purpose is the supply to the closed system. A closed system inhibitor works by laying down a thin film over the surface of the system metal and should be chosen carefully taking into account suitability for all materials used within the system, a guide on Accepta products is available above by selecting ‘sort by system materials’. It is important that the recommended chemical reserve is maintained in the system to cover for a minor loss of water within the system, or general degradation and absorption of chemical within the heating system, the aim is to only require occasional chemical top-ups. pH is generally kept within a range of 8 – 11 to promote a less corrosive environment however as noted above systems with aluminium should be kept around 8.5 as the metal is known to corrode at higher pH levels. For more information and expert advice please contact us. Accepta also recommends the advice offered in the BSRIA closed heating system guide which can be downloaded here.